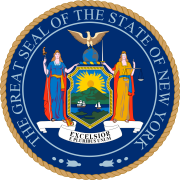 The 1920 United States presidential election in New York took place on November 2, 1920. All contemporary 48 states were part of the 1920 United States presidential election. New York voters chose 45 electors to the Electoral College, which selected the president and vice president. New York was won by Republican Senator Warren G. Harding of Ohio, who was running against Democratic Ohio Governor James M. Cox. Harding’s running mate was Governor Calvin Coolidge of Massachusetts, while Cox ran with Assistant Secretary of the Navy Franklin D. Roosevelt of New York. Also running that year was Socialist candidate Eugene V. Debs of Indiana and his running mate Seymour Stedman of Illinois. Harding won New York State with an overwhelming landslide of 64.56 percent of the vote to Cox’ 26.95 percent, a victory margin of 37.61 percentage points. Socialist Party candidate Eugene Debs finished with a relatively strong showing for a third party candidate, taking 7.01 percent of the vote, more than twice his national vote share, making New York his third strongest state in the nation. The strongest county for Debs within the state was the New York City borough of the Bronx, where Debs broke fifteen percent of the vote. Harding swept every county in the state of New York, winning every upstate county as well as winning every county in the New York City area and Long Island. All but five of New York State’s 62 counties went Republican with more than sixty percent of the vote. Harding won heavily populated New York City as a whole with a commanding majority, sweeping all five boroughs. Harding received over sixty percent of the vote in the boroughs of Brooklyn, Queens, and Staten Island, and also won majorities in Manhattan and the Bronx. 1920 was the first of only two occasions in which a Republican presidential candidate has won all five boroughs of New York City since the city’s incorporation in 1898, the other occasion being 1924. Likewise, this was the first of only two occasions (the other being 1924) in which a Republican has won the boroughs of Manhattan and the Bronx since they took their modern forms with the creation of Bronx County in 1914. Finally, since the city's incorporation, 1920 remains the only election ever in which a Republican presidential candidate has won an absolute majority of the vote in all five boroughs as well as in New York City as a whole. In 1924, Calvin Coolidge would win New York City for the GOP once more, but with a plurality, and beginning in 1928, the city would become a Democratic stronghold that no Republican has since been able to win. In upstate New York, Harding also won decisive majorities both in rural and urban counties. Harding won over sixty percent in Albany County, home to the state capital of Albany, as well as in Erie County, home to the city of Buffalo, and in Monroe County, home to the city of Rochester. 1920 made Warren G. Harding one of only three presidential candidates of either party who has been able to sweep every county in New York State, the only others who have done so being Republican Calvin Coolidge in 1924 and Democrat Lyndon Johnson in 1964. Harding's 64.56% of the vote in New York State remains the highest vote share any Republican presidential candidate has ever received in the state, and the second highest vote share any candidate of either party has ever gotten in the state, beaten only by Democrat Lyndon Johnson’s 68.56% in the Democratic landslide of 1964. Harding’s landslide victory margin of 37.61% remains the widest margin by which any candidate of either party has ever won New York State, beating even Lyndon Johnson's 37.25% in 1964. ^ These were for Lyndon Johnson against Barry Goldwater in 1964 and for Bill Clinton against Bob Dole in 1996. ^ "1920 Presidential Election Results - New York". Dave Leip's U.S. Election Atlas. Retrieved 2013-07-27. This page was last edited on 16 January 2019, at 14:05 (UTC).